Ms Prosperina is a genetic monster trying to take over the world by spiking the coffee at her Starry Eyed Coffee Hut chain … and she’ll stop at nothing. It’s up to her unwitting creator, the geneticist Professor Quan, to stop her. In an attempt to correct his mistake, Professor Quan creates a network of people with the power of true love genetically coded within them. They alone might resist Ms Prosperina’s attempt to change the course of humanity. Everything hangs in the balance when Eddie, altered at birth by Quan’s genetic mutation powder, fails to follow his pre-ordained destiny. The trauma of his father’s death has left Eddie drifting through a meaningless life and has caused him to stray from Quan’s master plan. Will Quan succeed in helping Eddie regain the light behind his eyes and will they succeed in foiling Ms Prosperina’s evil plans? Could the world really end at General Beauregard’s 24-hour fried chicken restaurant? You can purchase a signed copy of Fishing for Light directly from the author for $14.99 including shipping. Fishing for Light by Nathaniel Sewell tells an incredibly entertaining tale that is full of quirky characters and grandiose schemes. I totally enjoyed immersing myself in this satire. 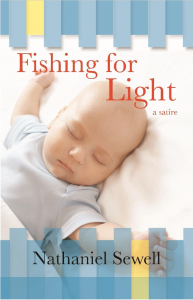 Nathaniel Sewell’s FISHING FOR LIGHT is a satiric look at the use of technology and particle physics to control the human race. Edie Wilcox finds himself caught up in this unseen “quantum war” between Professor Quan and his evil genetically modified daughter, Ms. Proserpina.